The plant Of the Month for October is…. 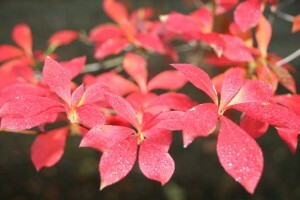 Enkianthus perulatus. A previous winner of plant of the month but worthy of the title agin. This shrubs outstanding ability to give a brilliant display of autumn colour, even here is Cornwall, makes it garden worthy for any garden. In the spring there are small “Lily of the valley” type creamy white flowers. But it’s the autumn when she comes alive. This time of year the foliage starts to turn from green to purplish then finally vibrant red. A true performer in the garden. October’s entry makes the PPOTY (Plant Personality Of The Year) awards short list. Two months to go and then I will be counting down to this year’s winner. Follow the hash tag #PPOTY18 for all the latest news from the awards ceremony starting mid December.